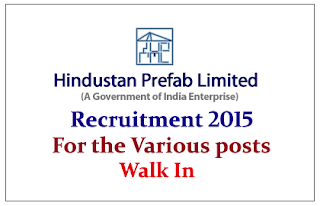 Hindustan Prefab Limited is recruiting for the post of Project Manager for the year 2015. Interested and Eligible candidate attend Walk In interview on 07th May 2015. 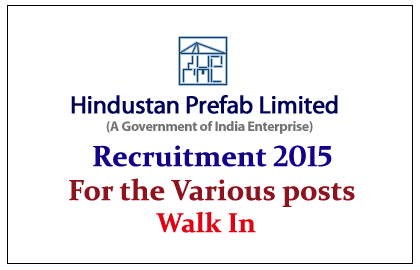 Hindustan Prefab Limited (HPL), a Central Public Sector Enterprise, an ISO 9001:2008 Certified Civil Engineering Organization presently engaged in the field of Construction, Design, Project Management, Real Estate etc. with its Corporate Office at New Delhi and having offices all over India is looking for result oriented Engineering Professionals having recognized degree/diploma purely on short term contract basis for its existing and upcoming projects in various parts of the Country including North Eastern Region, initially for a period of six months extendable by mutual consent, possessing qualifications, experience and expected salary as shown against each. Eligible candidates can attend walk In Interview on 07 / 05 / 2015. For more details kindly check official Notification.